The following is a reflection on the genesis of MoMA’s recent MOOC on Photography. We are acutely aware that while taking, viewing, and sharing photographs is second nature to most, it is not synonymous with visual literacy, and we wanted the course to encourage awareness around this distinction. We hope this post will introduce museum and classroom teachers to this MoMA resource on photography and encourage its use, where appropriate, as self-guided learning for your students and as a supplementary resource for survey and elective courses in this area of art history and practice. Coursera is a massive open online course (MOOC) platform with a mission “to provide universal access to the world’s best education.” In 2013 Coursera invited MoMA become a Teacher Professional Development partner. Seizing the opportunity to experiment with offering free online courses to an even larger audience, we produced three MOOCs—Art & Inquiry: Museum Teaching Strategies for Your Classroom, Art & Activity: Interactive Strategies for Engaging With Art, and Art & Ideas: Teaching With Themes—that explore pedagogical strategies for K-12 teachers. Thus far, 200,000 learners have participated in these MOOCs, 40% of whom did not, in fact, self-identify as teachers. But perhaps more surprising, for 98% of learners surveyed, this was their first encounter with MoMA. 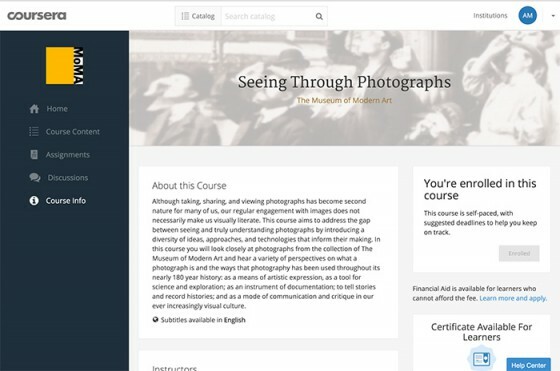 Based on the success of the first three MOOCs, in 2015 Coursera invited MoMA to become a full partner, thereby encouraging the Museum to develop courses for general audiences, and both MoMA and Coursera identified photography as a prime topic to explore. MoMA Curator Sarah Meister in the cold storage archives. Rather than tracing a formal chronological history of photography, the resulting course—titled Seeing Through Photographs—uses works from MoMA’s Collection as a point of departure to encourage participants to look critically at photographs through the some of the diverse ideas, approaches, and technologies that inform their making. The Museum’s departments of Digital Media, Education, and Photography worked collaboratively to develop goals for learning outcomes and a content strategy for the course that would not only foster deeper engagement with photography’s past and present, but examine how various factors including editorial control and modes of circulation influence our reception of photographic images. The course was designed to encourage learners to explore the gap between seeing photographs and truly understanding them, and to expand approaches to the medium through close looking at photographs. At the heart of the course content are newly produced vérité films and audio slideshows, which introduce learners to the perspectives of twenty artists and scholars (including Vik Muniz, Katy Grannan, Marvin Heiferman, Akram Zaatari, and Martha Rosler to name a few) about photography and the many ways in which it has been used throughout history and into the present day: as a means of personal artistic expression; a tool for science and exploration; a method for documenting people, places, and events; a way of telling stories and recording histories; and as a mode of communication and critique in our increasingly visual culture. From a pedagogical perspective, we felt it was important to introduce learners firsthand to the widely varied ideas and processes of artists working with photography today to model different approaches to contemporary images. The artist interviews are supplemented with text-and-image slideshows featuring other works from MoMA’s collection to provide further context for the key ideas explored in each module. Learners are also assigned readings, many drawn from historic and recent MoMA publications on photography. The course is structured around six modules, one of which, called “One Subject, Many Perspectives,” examines photographs of the moon taken throughout the medium’s history. Looking at a single motif not only helps introduce learners to key changes in photographic technologies, but also to the ways in which vernacular, scientific and artistic portrayals have played a role in shaping our understanding of this universal subject. In another module, we enlisted artists to discuss their approaches to photographing people—for some, those closest to them, for others, strangers on the street. Another module explores works by artists who reuse existing photographs to critique widely accepted narratives about history and culture. In his interview with Meister, Hank Willis Thomas said, “I feel it’s important that we take responsibility in actually mining and looking at the images that our society is creating so we can really get a broader perspective of our time.” He provides insight into how his process of ‘unbranding’ advertisements reveals the underlying messages and biases they convey. In the digital era it is critically important to recognize the difference between a photograph (which is both an image and a physical object) and a photographic image (one that can assume new characteristics specific to the device on which it is seen, but which has no material presence). In an effort to tease out these differences, the course’s final module includes interviews with artists (featured in Ocean of Images: New Photography 2015) who explore contemporary photo-based culture, specifically focusing on connectivity, the circulation of images, information networks, and communication models. While they do not share a physical classroom, at any given time, thousands of learners from around the globe are engaged in lively exchanges and debates in the course’s discussion forums. While some discussion questions are posed by the course instructor, the vast majority are initiated by learners and address a range of topics—from the ethics of documentary photography to whether or not it is important to make categorical distinctions between fine art and vernacular photographs. Though course materials are available free to anyone who enrolls, learners who opt to pay for a verified certificate of completion must write two essays applying themes explored in the course to photographs of their selection, which are then peer-reviewed. Because Seeing Through Photographs is offered on demand and learners can register for the course at any time, MoMA will continue to activate the course in different ways—most recently by broadcasting videos of exhibition walkthroughs via social media. In June, Sarah Meister hosted a Quora Session in which she answered questions submitted by readers that paralleled topics explored in the MOOC. The session received more than 1.2 million views in just one week. Given the popularity of the MoMA’s previous MOOCs with Chinese learners as well as the demand for the Museum’s recent photography publications by a Chinese market, a Mandarin version of Seeing Through Photographs launched in October 2016. To date, over 200,000 learners have enrolled in Seeing Through Photographs, with representation from over 160 countries and territories, providing access to learners who may never have the opportunity to visit MoMA. Coursera’s administrative dashboard provides the Museum with access not only to statistical information about how many people visit and actively participate in the course, and their countries of origin, but also how many times each piece of content is accessed, and how highly it is rated by learners, detailed analysis of performance on assessments, as well as learner retention rates. Having this information in tandem with feedback from individual leaners has been instrumental in targeting improvements. MoMA was founded in 1929, chartered as an educational institution. As its founding Director Alfred H. Barr, Jr. later clarified, a primary function of the Museum is to be “educational in the broadest, least academic sense.” This approach remains at the core of the institution today, embodied by our goal to be the most engaging museum of modern art contemporary art—for everyone. To achieve this, MoMA must continue to engage with communities not only on- and off-site, but also in the digital space. We appreciate that meaningful teaching and learning through art begins with a deep understanding of both art and audience. Seeing Through Photographs has been a particularly successful model, drawing from our distinct skills and perspectives, and applying them towards this shared goal. Authors’ note: Portions of this text will be published in a forthcoming Routledge anthology on photography and visual culture.